I’m going to start this blog by saying that since I am subjecting you all to an entire blog post about Celine Dion, there are a ton of recipes as an added bonus/consolation prize for your patience and readership. 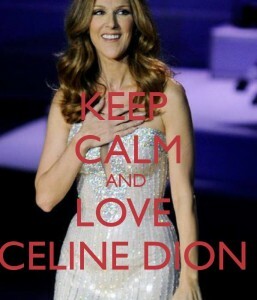 So without further ado, happy birthday Celine Dion! What does this have to do with the Chestnut Street Inn you ask? Well, most of you who have stayed with us know what an affinity I have for this Canadian songstress. So in honor of her 46th birthday today I thought, what if I was actually throwing a party for her and cooking her a special birthday dinner? Wishful thinking I know, but at least I can plan the menu virtually and have fun with the idea. 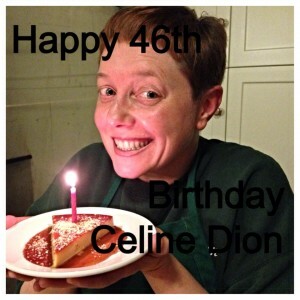 So, without further ado, if I was hosting Celine Dion for her birthday, this is what I would make her and why. I will preface my menu with saying that Celine is from a small town called Charlemagne, Quebec. She is the youngest of a very large family with 13 older brothers and sisters. The celebration of her birth would necessarily include her entire family, including her mother, brothers, sisters, their spouses and children, her husband Rene and of course her three children, Nelson and Eddie (the twins) and her thirteen year old son Rene Charles. So I would need quite a substantial meal. Back to Quebec. Much of the food in that region is very French in influence with a distinct similarity to some of the foods you would see in New Orleans, a result of the Acadian heritage linking the two. I would want to incorporate some flavors from home in this menu. Additionally, Celine’s husband Rene is of Lebanese descent and it is well known that he loves food and especially Lebanese food, a personal favorite of mine as well. So I will incorporate some Lebanese foods as well. Finally, Celine has traveled the world on tour and in watching some of her tour videos as well as other interviews, I have gleaned a few tidbits about her eating habits. She might be lean, but the woman loves food. She’s just one of those lucky people who seems capable of eating whatever she wants without gaining an ounce. She loves salty things, especially french fries and potato chips. She enjoys an occasional glass of champagne but doesn’t drink a lot to protect her voice. She takes her coffee with cream, no sugar (Yes, I know. Get a life Monika.) She enjoys chocolate, especially Belgian milk chocolate. So without further ado, here is my happy birthday Celine Dion menu. For the appetizer I would begin with a trio of Lebanese inspired Mezze. Hummus, Tabbouli Salad and Dolmades. These are three of my faves and ones that I know I make delicious versions of. Combine cooked and cooled bulgur wheat with the tomatoes, cucumber, scallions, garlic, parsley, cilantro and mint. To prepare dressing, whisk lemon juice and olive oil along with the salt, pepper, cumin and paprika until well combined. Pour over the bulgur wheat and vegetables and toss gently to mix. Allow to marinate for at least one hour in the refrigerator. This salad tastes better after marinating 24 hours. Heat oil and butter in a medium sauté pan over medium high heat until the butter has melted and is bubbling. Add shallots and scallions. Saute for a minute or two or until they begin to turn golden. Add the garlic and sauté for one minute or until fragrant. Add rice, salt, pepper, oregano and dill week and sauté rice for one minute to toast it. Add 2 cups chicken broth and bring to a boil. Cover and reduce heat to a simmer. Cook for approx. 16 mins or until all the liquid has been absorbed. Don’t peek. Rice won’t cook if you remove the lid. Fluff rice with a fork and transfer to a bowl to allow to cool. Once it has cooled, add parsley, mint, cilantro, chopped tomatoes, pine nuts and dried currants. Toss well to combine and adjust seasoning to taste. Prepare large stock pot for cooking. Drizzle bottom with olive oil and layer with sliced tomatoes. To assemble dolmades, take each grape leaf and trim the stem. Place approx. 1 Tbl of filling at base of the leaf. Fold over the edges and roll the leaf up like a burrito. Place on bottom of stock pot. Continue until the bottom of pan is covered in a single layer with the dolmades. Drizzle with more olive oil and some lemon juice. Continue assembling and layering dolmades until all the filling is used up, drizzling with lemon juice and olive oil between each layer. Cover approx. ½ full with chicken broth. Use a smaller place placed on top of the dolmades to weigh them down so that they don’t unravel during the cooking process. Bring to a boil over medium high heat. Cover and reduce to a simmer. Cook for approx. 20-30 mins or until the broth begins to bubble around the edges of the plate. Remove from heat and allow to cool in pan completely. Serve either at room temperature or refrigerate and serve cold. They can be made a couple of days in advance and kept in the refrigerator. For the entree, I return to Quebec with a very traditional dish called Tourtiere, which is a meat pie not unlike a British pasty or even a Spanish Empanada. This version throws a little French flair into the mix and I prefer making mine individual size as opposed to making it in a pie shape for ease of service. Heat oil in large saute pan over medium high heat. Add onion and saute for 3-5 mins until translucent. Add garlic and saute for one minute until fragrant. Add carrots, celery and meat. Saute until the meat is browned and the carrots/celery are slightly softened, approx. 8 mins. Season with salt, pepper, herbes de provence, allspice and parsley. Deglaze the pan with cognac. Reduce heat to a simmer and cook uncovered until all the liquid has evaporated and the meat is cooked through. Adjust seasoning to taste and allow filling to cool completely. Preheat oven to 375 degrees. Sprinkle puff pastry sheets on both sides with flour. Roll each sheet out until the seams no longer show and the sheet is approx. 1/4″ thick. Cut each sheet into quarters. Divide filling evenly among the 8 squares. Do not overfill. Beat the egg with the 1 tbl water. Grease a baking sheet with cooking spray or alternately line the baking sheet with a silicone pad. Using the beaten egg as the glue, brush the edges of each sheet with egg wash using a pastry brush. Fold each sheet in half, pressing the edges together and crimping with a fork to seal tightly. Place the tourtieres onto the greased baking sheet. Brush the tops of the tourtieres with egg wash. Place in the oven and bake for approximately 20 mins or until the tops of the tourtieres are golden brown. Allow to cool for 5 mins before serving. Going along with the French connection, we are going to follow suit with the French and serve the salad after the entree. This will be a lovely salad of simple greens, sea salt and rosemary crusted roasted fingerling potatoes, fresh blanched haricots verts, grape tomatoes and a light Dijon vinaigrette. Combine all the ingredients in a jar with a tight fitting lid and shake well until emulsified. Will keep for up to 2 weeks in the refrigerator. The obvious choice here is chocolate. A delectable Mousse au Chocolat is in order but with a twist. I like to do mine Mexican Hot Chocolate style with a tiny kick of heat. This would be paired with a lovely glass of Veuve Cliquot champagne and as a bonus we would include some profiteroles, which is what Celine and Rene had at their wedding. A candle in the profiteroles so she can make a wish and the meal would be complete. Beat yolks, vanilla, cinnamon, pepper and nutmeg vigorously for a minute or until thick and pale. Place coffee and sugar in a small saucepan over medium heat to melt sugar. Beat melted sugar/coffee mixture slowly into egg yolks to temper. Place Amaretto and chocolate in a heat resistant bowl over a saucepan of simmering water. Melt chocolate. Place egg yolks over simmering water and whisk vigorously until thick and pale like greek yogurt, approx. 5-8 mins. Remove from heat and beat with hand mixer until double in volume and cooled, approx. 5 mins. (I actually set the timer on this so that I don’t take any shortcuts. Adequate beating is crucial to get the right texture of the mousse) Add butter into melted chocolate and whisk until smooth. Fold chocolate into yolk mixture. Beat egg whites with cream of tartar and salt until stiff peaks form. Add ¼ beaten whites to yolk/chocolate mixture. Fold to lighten. Add remaining whites to yolk/chocolate mixture and fold gently to combine. Place in serving dish or transfer into individual wine glasses for serving. Refrigerate for at least 2-3 hrs before serving. Serve with homemade whipping cream and a pinch of cayenne pepper as a garnish.